Precision or approximate mosaicing. In precision mosaicing, the photograms are aligned and superimposed according to precise and measured reference points, while in the approximate version, the mosaicing is done by moving the photograms using the mouse and superimposing them by sight. Relative or progressive mosaicing. In relative mosaicing each photogram is superimposed on the preceding one using 2 or more common points. But this means that one small error is transmitted to all successive photograms and is multiplied proportionally to the number of photograms in the mosaic. In progressive or absolute mosaicing each photogram is positioned independently, according to points which are measured with reference to a fixed point, for example the left-hand corner of the building. In this way errors are not reproduced, but are limited, no matter how many photograms are involved. A special example of progressive or absolute mosaicing is the use of a drawing of a facade as a base onto which the various images of the mosaic are mapped. Mosaicing of one or more layers. 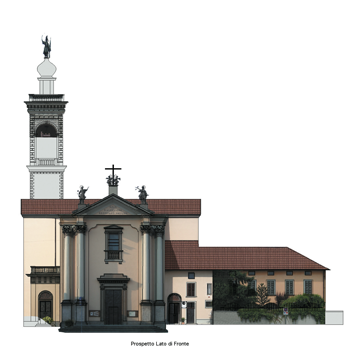 If the building’s facade has protruding or sunken elements, each of these parts is on a different layer, therefore the front view must be reconstructed by means of a mosaic with several photos or different parts of the same photo. Not all programs allow mosaicing of different layers. Mosaicing of non-adjoining parts. It is often impossible to photograph all parts of a building – some may be inaccessible or be hidden by other elements, such as trees. In such cases it is important that the program of photogrammetry is capable of creating an accurate and scaled mosaic, even though incomplete. Superimposed mosaicing. In this type of mosaicing general views are taken of the facade as well as photos of certain details. These are then superimposed on the main image for greater detail and precision where necessary. 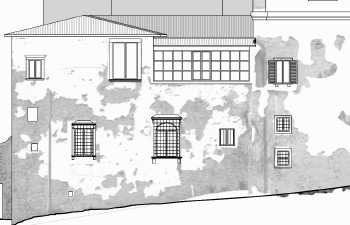 This technique makes great use of the transparency function mentioned above as it needs to be able to use all shapes of cut-outs in order to obtain the exact outline of architectural details. Mosaicing of curved surfaces. Curved or irregular surfaces need mosaicing too, in fact, they have greater need of surveys from different angles. This type of mosaicing is only possible, of course, if the program can straighten up the surfaces first. Mosaicing over a drawing. Photos or parts of photos are mapped over a drawing which has normally been imported in some standard vectorial or raster format. Each photo is made to correspond to a part of the scale drawing with excellent results.